It’s 5:30 p.m. and you walk in the door from running errands, having accomplished everything on your to-do list and finish up your third phone call where you have effortlessly handled another minor emergency. You get dinner going as the kids come in the door, put their backpacks and shoes where they belong and offer to help with dinner and setting the table – washing their hands first, of course. Your husband walks through the door as he finishes up a phone call with last-minute business to attend to. You and the kids greet your husband with a big “group hug” and spend the next several minutes talking about what a wonderful day you had. You finish preparing dinner and all sit down together to enjoy your meal and uninterrupted family time. Are you cracking up yet? I am! As much as I strive for that scenario, it rarely happens and when it does, it certainly doesn’t happen quite so angelically as that! This post may contain affiliate links. For more information, see our privacy and disclaimer page. It’s 5:30 p.m., you’ve been running like a crazy person all day…you know, those dreaded errands that make you feel like you’re accomplishing absolutely nothing and yet leave you feeling like you’ve just competed in an “Iron Man” competition. You’ve just dealt with your third minor catastrophe for the day, walked in the door and started dinner. The kids come running in wanting to know what’s for dinner and when will it be ready and can you please drop them off at Timmy’s to finish up their school project tonight – the one that’s due tomorrow… oh, and do you happen to have everything they need to finish that project? In the meantime, your husband walks through the door on his cell phone trying to finish up some last minute work. You give each other that little “chin in the air” nod and go back to making dinner. All the while, the dogs are barking like wild animals because they have so much to tell you about their very busy day patrolling the grounds and keeping everything safe for you. Everyone grabs a plate and, hopefully, you make it to the table, but chances are you’re all off and running again. You give your husband another one of those “chin in the air” nods as you head back out the door to divide and conquer and get the kids where they need to be. Which life looks more like yours? we have nothing left for the ones that we love. Were you short-tempered because of all the “lolly-gagging” that went on, (Or does that only happen at my house?) were you patient and truly took the time to enjoy each other, or did you just give your family your leftovers again? It’s tough, isn’t it? You have to be “on” for everyone all day long so by the time you get home you’re exhausted and having nothing left to give. In this electronic world we live in, it is especially difficult to give each other our undivided attention and to leave work at work. We are plugged in constantly….getting emails at home – something that would have previously been dealt with in the morning is now taking our attention right then and there….attention that is taken away from the most important ministry we are called to…our families. We have to work extra hard to show the ones we love that they come first. Why should colleagues and complete strangers get the best of us? It doesn’t seem right and yet, we do it day after day! All too quickly our kids will be grown and gone. Truly, just blink and they are heading off to school or moving out. Shouldn’t we be giving our children our best and trying to make our spouses fall in love with us, again and again, every single day? Instead, we give them our scraps. 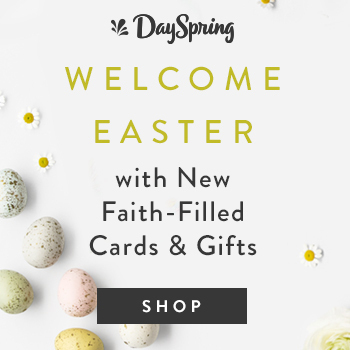 In a free bible study, I recently went through from Living Our Priorities, Andre’ and Timberley Gray teach us how to live within the priorities of God. You notice that God is first, followed by spouse and kids. And then work is all the way at the bottom of the list and yet, so many of us get this order mixed up. We often put work, ministry, and outside obligations before everything else, including God. God calls us to teach our families and raise our children so that they understand these priorities and the best way for us to do this is to live within them. To show them how God expects us to live by putting them before all of the outside commitments and responsibilities. It is our job to show our spouse and children that they come before anything else. That they deserve our best. Nothing shows love to our families like undivided attention. So, I asked my guys what makes them feel most loved. For my husband, I can actually see his “love tank” fill when I stop what I’m doing, listen to what he is saying and tell him how proud of him I am. Honest to goodness, I can actually see him puff up right before my eyes. All of this equates to quality time spent together and letting them know that we love them unconditionally, that they’re the most important people in our lives. So what are some ways you can make your family a priority? If you work from home, make sure you finish 30-45 minutes before everyone starts coming in the door so you can start dinner and wind down from your own day of work. Ban cell phones during dinner – I know a lot of us have already done this, but you’d be surprised at how many people still allow it. Go for that family walk after dinner, head to the park, sit on the front porch. Anything to get away from sitting in front of the TV and “vegging” out all evening long. Getting outdoors will do wonders for relieving the stress of a difficult day. Make an effort to shut down “shop talk” after a certain time. Our spouses are our best friends, so of course, we are going to talk about our days and even work through issues with each other, however, the discussions don’t have to go on through the evening. After you have talked about it, let it go and move on. If the kids have books to read for school, make it a family affair. Read together or perhaps hit the library after dinner. Spend time as a family in a daily devotional, teaching everyone the priorities of God. I know it’s tough. My boys are older now, but we went through all the night-time chaos in our house., and looking back, I know there were plenty of things I could’ve done to make the night easier and give my family my best. God gave you this family! He entrusted them to you! I know you are grateful for this every day of your life, so don’t just tell them how much you love them, show them what they mean to you. 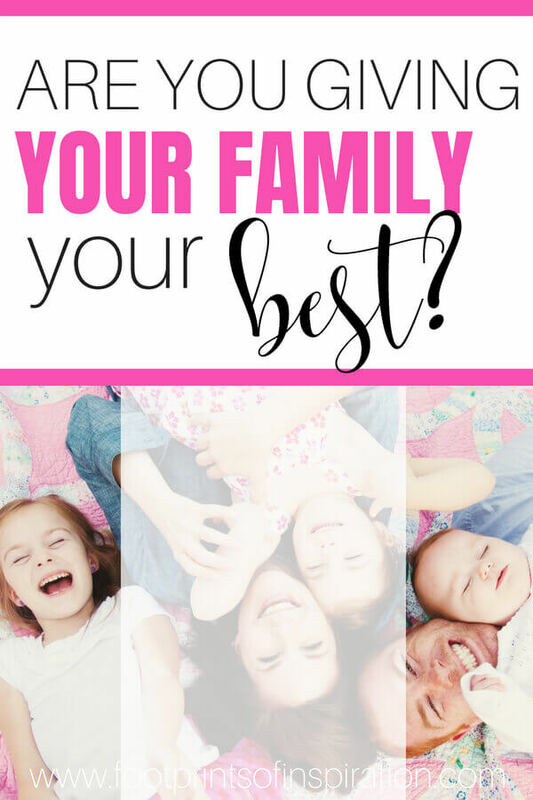 Sure, you may slip back from time to time, but just being aware of it and asking yourself, “Is my family getting my best,” will help remind you of God’s priorities. Go out today and show your family that they come first! 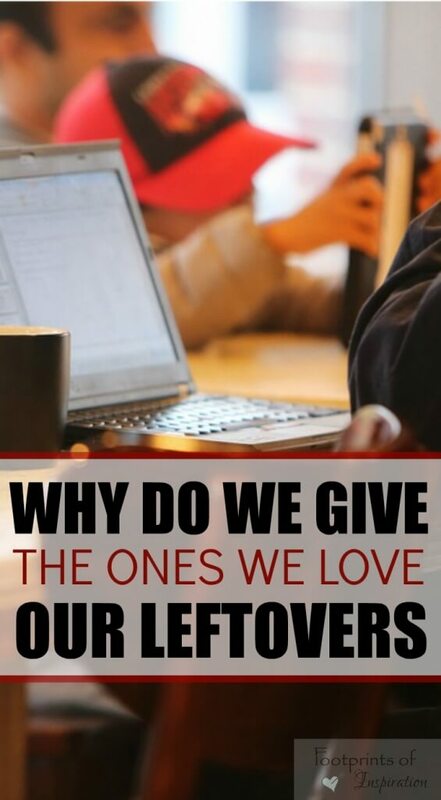 Do you find yourself giving just your leftovers? 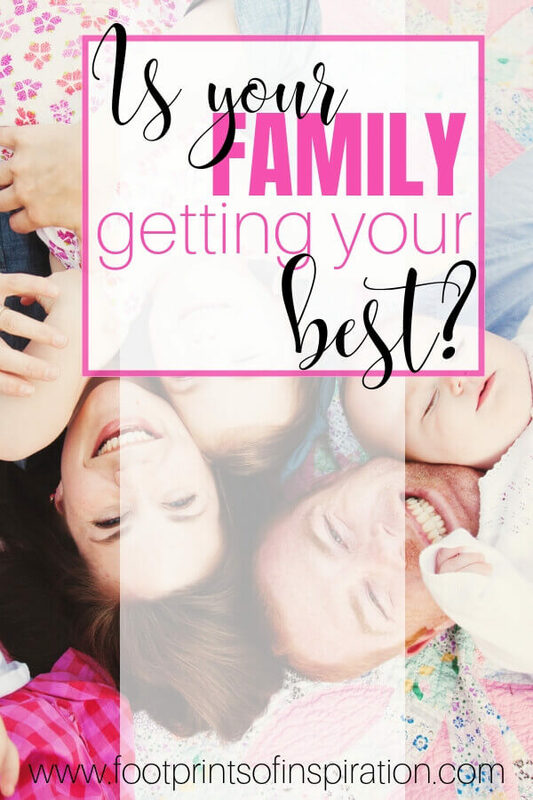 Or perhaps you have some great tips on how you give your family your best. I would love to hear them! Share them in the comments below. Thanks for joining me today! Be sure to sign-up for our newsletter below so you don’t miss a single post. Special Note: This post may contain affiliate links. Unless otherwise noted, by purchasing products through these links, I may receive a small commission, however, your cost for the item does not change. Through this commission, I can continue my blog and purchase items to help in the day to day running of Footprints of Inspiration. For more information, see our privacy and disclaimer page. Previous Post: « HAVE YOU BEEN ROBBED?